This cake has everything a person could want…a Nutella filling, thick, chewy cookie layers, and an ice cream cone topper!! It’s definitely an indulgent cake, but sometimes you need to treat yourself 🙂 If you’re a visual learner, you can watch me make this cake here. Preheat oven to 350 degrees Fahrenheit. Line and grease two 8 inch cake pans with parchment paper. Place a 2 inch metal circle cookie cutter in the center of each of the pans. Set aside. Combine the flour, baking soda, cornstarch, and salt in a large bowl. Set aside. In a medium bowl, mix the melted butter and brown sugar sugar together until smooth. Whisk in the egg, vanilla, then the egg yolk. Pour the wet ingredients into the dry ingredients and mix together with a large spoon or rubber spatula. The dough will be very soft, yet thick. Fold in the chocolate chips. Evenly divide the dough between the cake pans, filling the pans around the cookie cutter while leaving the center unfilled. Bake for about 25-30 minutes, until golden brown and fully cooked through. If you don’t have metal cookie cutters, you can bake normal cookie layers, and cut out the centers once baked. Allow both cookie layers to cool fully. While these cool, prepare the frosting. Beat the butter on medium-high speed until creamy. Reduce the speed to medium-low and slowly add the vanilla and salt. Add powdered sugar, in 4 installments, until it has all been incorporated. Mix in a VERY small amount of the blue and green gel food coloring (I mean a drop at a time), until desired color is reached. Increase the speed to medium-high and beat for another minute. Once you’ve made the buttercream, you can move onto the last aspect of this cake, the chocolate ganache! We’ve saved the best for last. Place the cream into a microwave-safe bowl. Heat on high for about 45 seconds (until its just beginning to bubble). Gently pour chocolate chips into the cream, and let sit for two minutes. After this, stir until the mixture is fully incorporate. Place in the fridge for about 15 minutes to allow the mixture to cool to room temperature. Once the cakes are fully cooled, assemble the cake. place a small dab of frosting onto the surface you will be using to serve the cake, to secure the cake. I always use cardboard cake centers, but this can be done on a cake stand or plate as well. Place down one cookie layer, and frost the top with buttercream. Place a cookie layer on top of this, and frost the top of the layer again. Also frost the center cut out of the cake. Cover the exterior of the cake with a thin layer of buttercream, and smooth with an offset spatula and/or cake bench. Heat up Nutella and 1/2 cup heavy cream in a heat-proof bowl for 30 seconds in the microwave. Mix until fully combined, then pour into the center of the cake, filling fully to the top. Place in the fridge or freezer for 10 minutes to allow the frosting to set. While chilling, scoop some buttercream into the ice cream, and shape into large ball. I find doing this in stages, and putting the cone into the freezer between additions of buttercream allows me to get perfect ice cream scoop shape. Remove from fridge/freezer, and apply a thick coat of frosting (about 1 cm). Smooth, and place in the freezer again. Once fully shaped, use a dab of buttercream to secure the cone to the cake, upside-down. While the second layer of frosting cools, pour the room temperature ganache into a squirt bottle of some sort (I use a cheap diner-esque clear ketchup bottle from Amazon). Take the cake out of the freezer, and place the ice cream cone upside down in the center of the cake. Squirt ganache over the frosting “ice cream scoop”, and allow it run down, until the entire scoop is covered. Then squirt ganache over the entire top of the cake, leaving about an inch of frosting uncovered. Spread the ganache evenly with a smooth utensil (knife, frosting spatula, etc. ), and work it out to the edges of the cake, so that the entire top of the cake is covered. Next, gently drop ganache down the edges of the cake. Start slowly, as you can always make bigger/longer drops as you go, but you can’t take back an epic stream of ganache (trust me, I’ve learned the hard way). The finishing touch is sprinkling the ice cream cone with sprinkles of your choice. hey! how gooey is the center filling when you cut the cake? It looks pretty liquid when you pour it in. Is there a big GUSH when you cut the cake? it’s a mixture of nutella and a but of heavy cream! Sadly it wasn’t as gushy as it was when I poured it, because it cooled! Do you have any pics of the inside of this cake? It’s sounds amazing!! For the cookie layers, in the directions you say “brown sugar and sugar” but in the ingredients you don’t list sugar (only brown sugar). How much sugar should be added? Is this regular sugar? Hi Chels, do you have a cook book I can buy? I don’t, just this blog, my YouTube channel and Instagram! Do these layers bake pretty thick? Like am I filling my 2 8″ pans pretty full? I am using 2″ high pans. The cornstarch just helps it have a chewy consistency! Since i want to the cookie layers to be flat, I didn’t include leavening agents in this recipe! Hi Chelsea! I love all your cake tutorials! I’ve become a little bit obsessed… I’ve only ever tried making a layered cake once before and pretty much failed, but you’ve given me the inspiration to try again and attempt a cake for my daughter’s 2nd birthday! 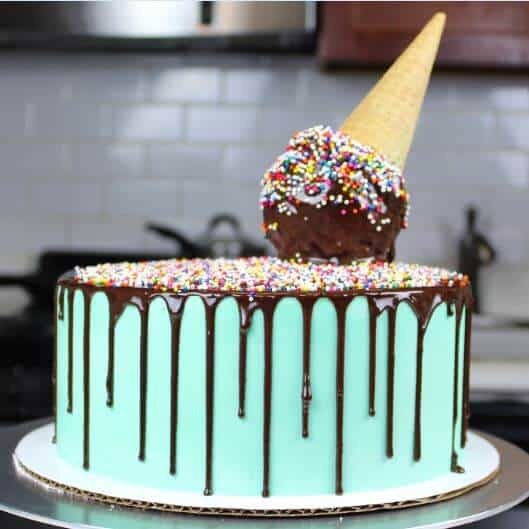 I’m thinking of combining your funfetti cake with the melting ice cream cone on top. My questions are: Is your “ice cream scoop” made of just buttercream? What do you think about making a cake pop/ball instead? Would one need to add additional support under the cake ball? Do you recommend a certain frosting to cake ratio to achieve the optimal cake ball consistency? I’ve made the scoop out of just buttercream ,and out of crumbled cake tops mixed with buttercream. I recommend using the crumbled cake and frosting method, it holds it’s shape better!! I usually just place it on top of the cake without a support (the ganache kind of holds it in place), but if you need to transport the cake anywhere you might consider inserting a dowel! I usually use 3 parts cake to 1 part frosting. Hope that helps, happy baking ? ?